Towards the end of last year my company, Collective Bias, was bought by Inmar. Inmar is headquartered in Winston-Salemn, North Carolina. I was beyond excited to find out our company would be traveling to HQ to get to know our new parent company! Well, except for the flying part. I wasn't excited about that. I contacted the travel company and explained to them my fear of flying. They were so amazing, they made it so I only had to fly into Charlotte and drive up to Winston-Salem. In fact, they were SO amazing, the day I was flying out, they said I could drive down if I was too afraid to fly! I flew. Fred made me. 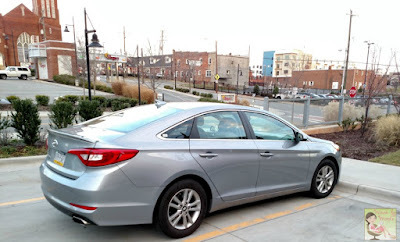 When I got into Charlotte, I headed to the car rental counter and was given several cars to choose from. I was able to go into the parking garage and pick whichever one I wanted. I had 2 Impalas, 1 Cruz, and 2 Sonatas to pick from. I felt like I had time to sit back and peruse the cars at my leisure. After I'd walked past them all once, and looked inside the Impala, more people started showing up. What the what?! I hadn't had a chance to look at the Sonata, but was interested in the Impala, but as soon as I went to look at the Sonata, two guys got into the Impala. 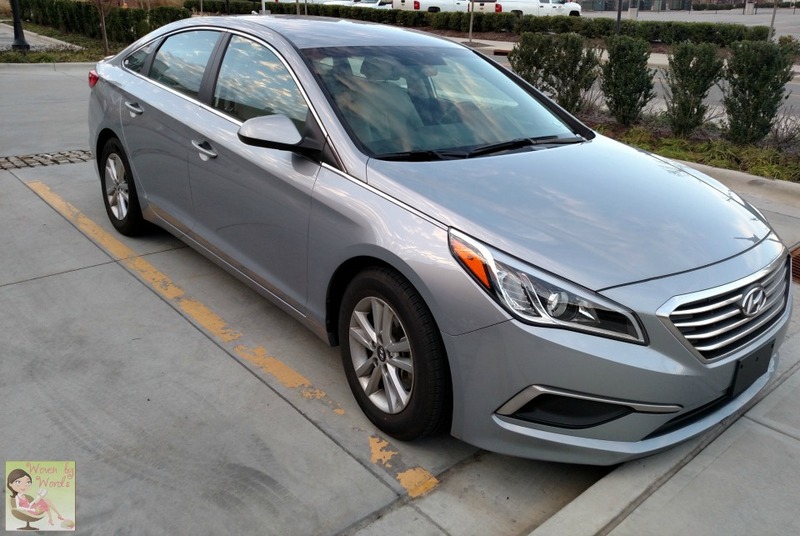 I knew I didn't want the Cruz, and I wasn't interested in a silver car, so I hopped into the gray Sonata. As you get into the car it plays a little tune. Cute! I was surprised at how spacious it was. I'm not used to riding in sedans. 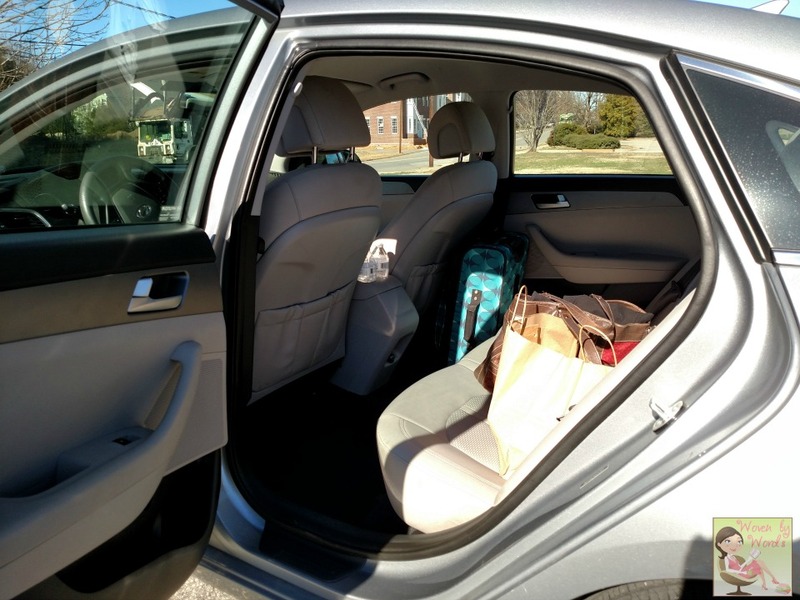 The back seat would easily fit three people with a lot of leg and head room. I felt very comfortable in the driver's seat. I had to drive an hour and a half on the freeway, and it was fantastic. The car rode so smoothly. It was a really quiet drive. My last two vehicles have been AWDs and they're not quiet ones. The silence of the road made quite the impression on me! I was able to pair my bluetooth with the car, but was bummed there wasn't a map I could use. I know that it's a feature that's available, just not with the rental. Thankfully the drive was all on the freeway. Speaking of the drive on the freeway, that was pretty awesome. This little car has a ton of get up and go to it! I was driving in the afternoon on a Monday. Not much traffic so I was able to cruise along. Passing was a breeze if needed. When I got up to Winston-Salem, I was able to park in the garage not too far off the freeway near the hotel. It was kind of a stinker that I didn't get to drive it again until the day I left. I headed over to Old Salem to take a little tour of some historic buildings. Oh, and to GET into the car was "fun." 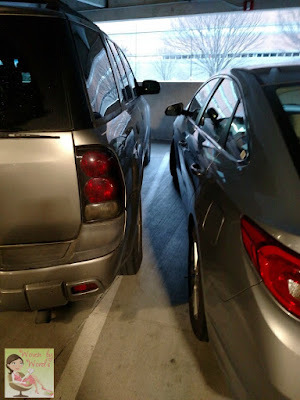 Someone parked next to me leaving barely any room to get in. Some people's children. I was "this" close to leaving a note letting them know exactly what I thought about their parking job. Driving through the little town was interesting. The brakes were touchy for sure. I kept telling myself every time I touched them that next time I'd be softer on it, but nope, kept forgetting. Oh my gosh, the blinker drove me batty. Do you remember when you were in elementary school and the music teacher handed out a piece of wood and a wand? Remember the sound it made when you'd knock on it, that woody block sound? EXACTLY what the blinker sounds like. The Sonata handled very well on the freeway and in the city. I liked the steering wheel. I know that may sound strange, but I liked how ergonomic it felt in my hands. Mine have always just been circular. This one is shaped so that your hands just fit perfectly at 10 and 2. The way my hubby drives is with his hand at 6 o'clock and they've left a perfectly sized spot for his big hand. I also liked that all of the steering wheel controls were on the front, not hidden in the back, and easy to understand! I can never tell what I'm pushing in Fred's car. One of the things that bothered me was how low the console seemed to me. I felt like I was looking down farther than normal. 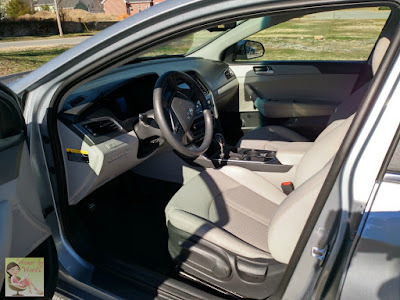 The steering wheel was in a position that's comfortable and normal for me, but the dashboard seemed rather low. I know it's just a small thing, but raising it even 3/4 of an inch would've been nice. I also didn't understand the intermittent wiper display on the dashboard. It didn't match the arm visuals when you changed the speed. On the arm, you start with the switch down, which is the slowest setting. As you look on the dashboard, it shows a bar at the bottom, but next to it, it says "high". As you click it up, the wipers move quicker, but the display shows the bars filling up as it moves away from the "high." Color me confused. Just the weird things I notice in cars. There were more things I didn't have time to check out to see if the car had certain features. I'm guessing I had a basic model. I also didn't have time to look at the manual. This model had a Sport and Eco mode for driving, and I wish I would've tested those out to see if you could actually tell any difference. I'm always leery about that sort of thing. Like, is this gimmicky and it drives exactly the same way no matter which mode? Oh, which reminded me of something I really did like. Ok, so in my current vehicle and my old minivan, if I was charging my phone using the car, if I turned it off, it would still charge my phone. Fred's car doesn't do that and it makes me nuts! I often need to power my phone while the car is off. Well, guess what? First, the phone will continue charging, and second...you can just use your USB cord! Love, love, love! Can you tell I don't have that feature in my Traverse? lol On either side of the USB plug in, two auxiliary input jacks. There's also lots of spots up front for holding little things. I also don't know what the trunk space looked like. Since I was the only one who need up riding in it, I never needed to check it out. My gas mileage wasn't bad, in fact it was pretty good. I got 37mpg which is a LOT better than my Traverse. 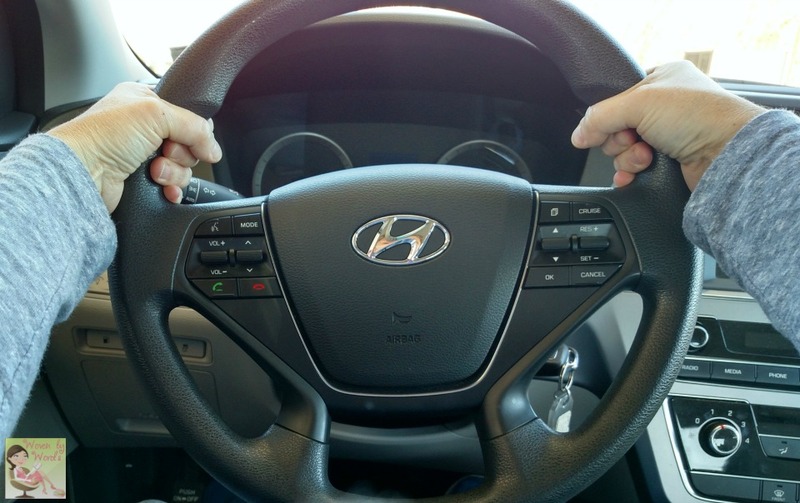 I'm not sure if I mentioned it earlier, but this was the first time I've ever driven a Hyundai. My aunt has either the Santa Fe or Tucson and loves it. I remember riding with her several times in it, and really liking how it handled. Let me just say, if I had a choice of rental cars again, I'd definitely choose this one. It was fun to drive, and could easily hold my family. What car is on your bucket list to drive?